I am all about simple dining. Most days are a rush, and I find myself opting for the easiest of meals to pull together, and a savoury platter is my quick and easy go-to. As we are in the middle of winter, we have been using a lot of honey with our tea here at home, so I have found myself trying to come up with some delicious honey combinations. I have long been a fan of blending the sweet with the salty, adding a little chilli to my chocolate and maybe and a slice of apple or two to a salad. 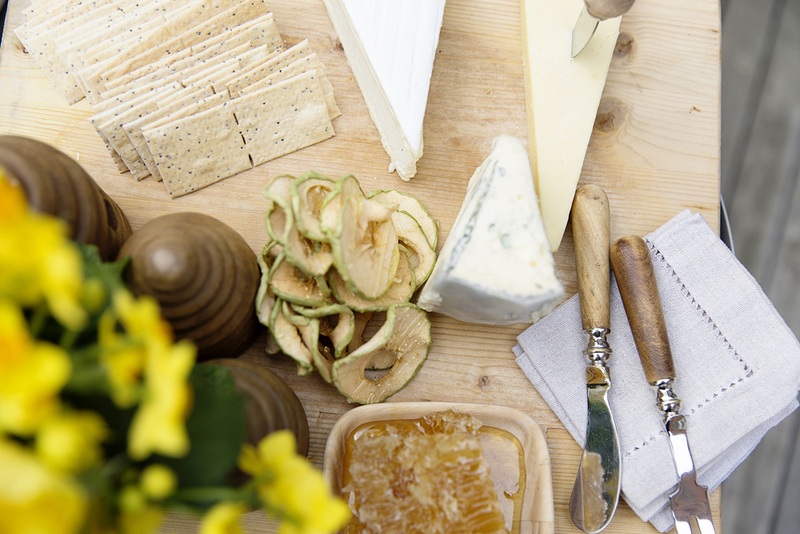 I love unexpected combinations and a honey and cheese platter ticks that box. Honey goes seriously well with cheese. The sweetest of honey drizzled over the bittiest of cheeses - yum! Hey comes in many different flavours with the most popular being the varietal. This means the bee has collected from an assortment of flowers to create their honey, and some bees are bred to collect from only a few types of flower only - say lavender, rose or something citrus. This changes the flavour of the honey, so when pairing it with cheese you can get really fancy and start matching flavours! I am a little more relaxed when it comes to flavours. When I pulled together, this cheese platter for a brunch recently went with the crowd pleaser of cheese - block of cheddar, blue cheese and camembert. Surround it with an assortment of crackers, a small plate of dripping honeycomb and a few honey drizzled dried apples and you’ve got yourself a sweet and savoury platter. I couldn’t rave about honey without including a delicious cocktail now could I? I do love my 5pm Gin & Tonic, so I am always on the hunt for a fun new gin cocktail to try, and this one is right up my alley. It comes with a cute little story that I love. In the time of Prohibition, gin didn’t taste so good so the idea was to cover it up with some lemon and honey, great idea especially when the combination works so well together. Credits : Cocktail Recipe from Post Prohibition. Photos: Lisa Atkinson, Copyright © Chyka Keebaugh.